Aylesham Hub project (formerly village hall) is making some important strides forward. So it is looking for people to come on board – with as little or as much time and energy as they want to offer. 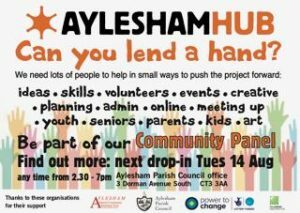 The project is aiming to form a community panel of volunteers and others who have an interest in wanting to build a new community centre for Aylesham and Snowdown. Do go and meet the team on Tuesday 14 August at the Aylesham Parish Council office – 3 Dorman Avenue South CT3 3AA. Pop in anytime between 2.30 and 7pm. All welcome. If you can’t make it that day, email the group at ayleshamcommunityvillagehall@gmail.com.